HDS is located in Escazú, S. José, Costa Rica. We count with modern installations and classrooms, some lessons take place outside to provide students with change and a breath of fresh air! Contiguo a Edificio Portofino, Transversal 144B, casa con rejas negras con una pequeña señal que dice "Torah Avenue". 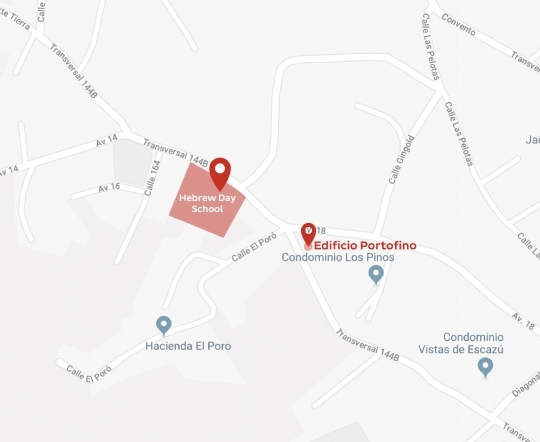 Puede encontrarnos en Waze colocando Edificio Portofino, y la escuela es contiguo al edificio. Next to Edificio Portofino, Transversal 144B, house with the black grille. It has a little sign that says "Torah Avenue". You can find us on Waze by putting in Edificio Portofino, and the School is next to it.